With nightclub popularity on the wane (the UK losing more than half its nightclubs in the past decade) a nightclub it is no longer about simply finding a large building and filling the space with dark walls and neon lighting. The nightclub customer of today is looking for a very different experience to that of the 80s & 90s. Socialising is a more important element, along with being entertained and having a visual experience to compliment the experience of sound. A designer’s creativeness can certainly be pushed to the maximum through the many innovative lighting choices available today. With thoughtful study and keen decision-making any kind of desire customer experience can be achieved and something really special can be created using the simple wonders of lighting. 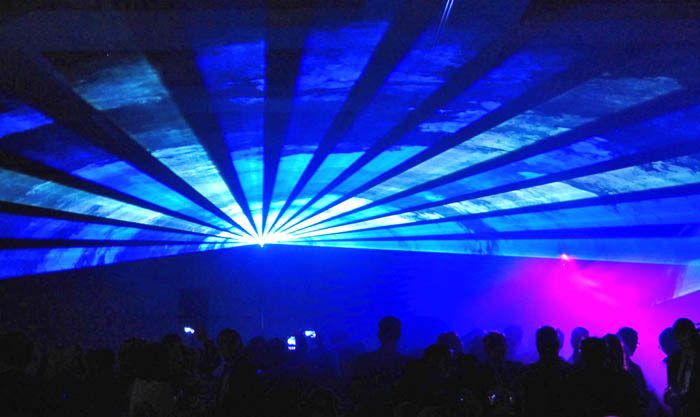 Design of lighting for nightclubs is one of the most exciting types of project in the field of commercial lighting. With great technology available, ranging from contemporary lighting, retro lighting, bold dramatic feature lighting and industrial style light fittings, a previously-considered dark expanse with empty unused spaces can be transformed into something truly impressive. Most modern day lighting design begins at architectural level, particularly within a large space such as a nightclub as there are lots of areas to consider and explore. To begin, a designer would look at recessed lighting, cove lighting and wall sconces (used for task, accent or ambience lighting) then move on to thinking about solutions for indirect lighting, surface mounted lighting, ceiling and fixed placed such as table lamps. The bar is the place where the business makes its money so lighting around the bar is a part of the project that needs it own consideration. Ideally full view of the bar area from all angles should be ensured. In alcoves and privates areas, functional coloured lighting creates visibility without limiting atmosphere. Indirect lighting for backlit signage, light boxes for posters and images, accent lighting that focuses on a particularly area or feature…the possibilities for being creative with lighting are endless! A final area, one that should never be overlooked when working on the lighting project, is stairways and step up platforms. These areas need continuous track lighting or edge lighting across all leading edges, vital to avoid health and safety incidents all too common in the evening entertainment industry. The lighting system in this area should have safety as paramount with clear paths and exits highlighted throughout.